Whitchurch travelled to Bowdon this week to play a very strong home team who were looking for revenge for the 4-1 loss to the Reds in the previous fixture, and they applied the pressure from the start. On an overcast afternoon, Bowdon were the first to shine, putting together a number of strong runs and passing the ball well in triangles down both wings giving Airan Jones and Tom Forster much to do throughout the game. With a number of key players unavailable this week, captain Alex Fry dropped back into central defence with James Partington and the back four did their best to repel the onslaught but the pressure told with three early short corners being taken extremely well to put Bowdon 3-0 up. Keeper Gareth Teggin, in his first game for the 1s, had a solid game and blocked a number of shots, but the penalty corner routines themselves were well practiced and executed with strength and speed. It was in small, key areas that Bowdon were winning; Whitchurch put together a number of fine moves through the middle, with Marcus Conway, Jack Barnes and Sam Conway holding the centre ground well and moving the ball through effectively at times, but the final balls forward weren’t getting through and some of the passes were speculative at best, with Bowdon taking full advantage of any mistakes. Up front, Nick Cooper was a constant threat in the dee, and the Ben Kimberley and Craig Hockenhull were both unlucky not to score with the Bowdon keeper having an excellent game. The second half was more level for the first 20 minutes as the Reds were able to keep Bowdon out better, with Teggin making some excellent blocks and Forster getting the clearances away, but the pressure told, as twice Bowdon managed to slip their markers from open play with more quick balls, triangles, darting runs and fine shots taking their total to five. A consolation goal came from the sort of play Whitchurch had been able to create in last week’s game against Keele with good movement up the left getting the ball to Hockenhull who laid it off to Cooper who ran across the dee taking the keeper with him before firing in a sublime shot. Whitchurch stay in sixth in the league with three games to play and will be keen to win next week’s home game against Chester 5s after narrowly losing in the away fixture. 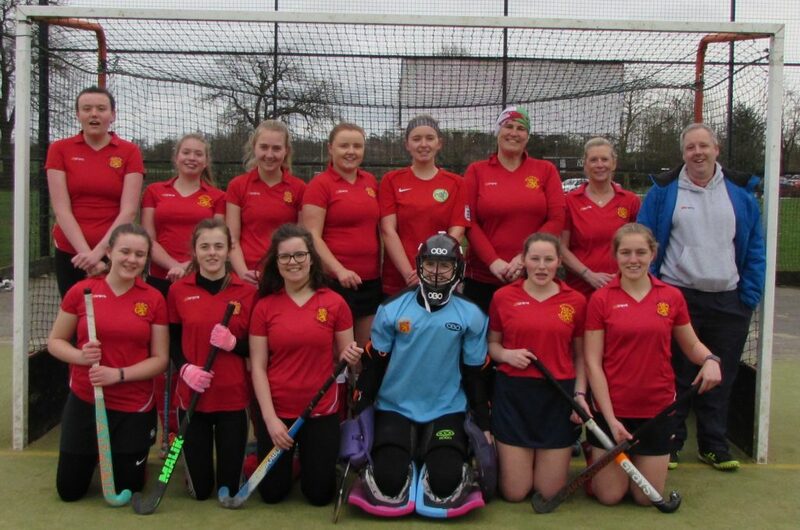 Whitchurch Ladies 1s played Timperley Ladies 4s at home. After a few hard matches Whitchurch were determined to work hard for a win. Whitchurch started the first half strong with Catherine Reece-Gresty and Chloe Lloyd defending the Whitchurch goal well from incoming shots from the Timperley players. After a few minutes of battling, Whitchurch were awarded a long corner where Lisa Sullivan drove down the base line and pushed the ball to Ellie Windsor who converted the first goal of the match. Whitchurch continued to work hard with Helen Machin and Captain Catherine Winter-Gresty making some good tackles and passing the ball around the Timperley players. After a lot of strong attacking play, Whitchurch’s efforts were finally rewarded with a second goal which was scored by Hebe Dixon. With Whitchurch’s hopes high, goalkeeper Maddy Sugden made some amazing saves and defender Catherine Reece-Gresty made some great passes to the Whitchurch players clearing the ball from their dee and leaving the score 2-0 at half time. After the half time break, Whitchurch remained strong with Sophie Ward and Izzy Huxley making some great runs and hits into the Timperley dee where Helena Dannenfeldt was able to score Whitchurch’s third goal of the match. Both teams continued to play well with Jess Caruthers making some great tackles and runs into the Timperley dee. Players Millie Edwards and Izzy Huxley made some good runs and passed the ball around the Timperley players well, managing to get the ball to Hebe Dixon on the base line who crossed the ball into the Timperley dee where Ellie Windsor deflected the ball into the goal for scored her second goal of the game. Timperley made some late breaks, however the final whistle went and the score remained 4-0. Whitchurch player Hebe Dixon received best player. 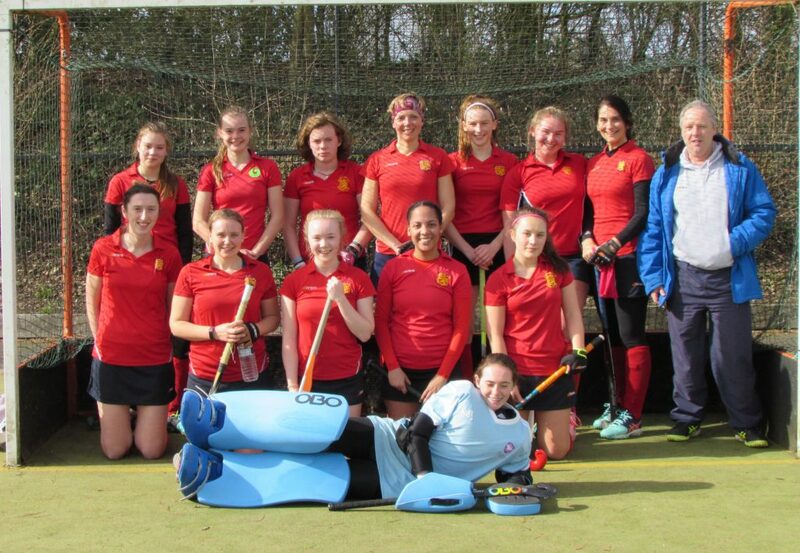 Next week, Whitchurch ladies 1s will play Wilmslow 3s at home. 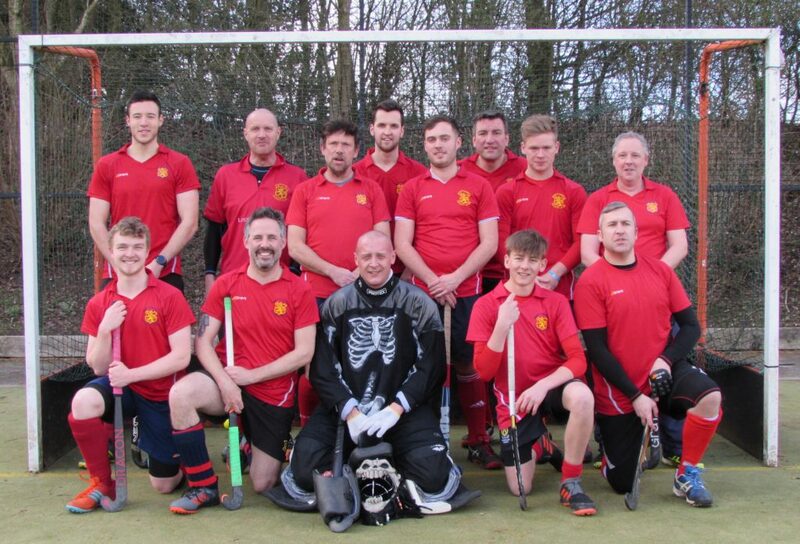 After two hockey-free weekends, the Men’s 2s returned to action with a lunchtime push-back at Oxton 5s. The Wirral side had a formidable home record, with most visitors on the end of big defeats, and only 1 goal conceded since September, so this was always going to be a challenge for the Reds. With non-hockey activities having a big impact on player availability on Saturday, the 2s were only able to field 10 players, and 14-year-old Owen Pearce bravely stepped up to play his first senior game in goal. Whitchurch started the game looking to keep things tight and not be too expansive with their attacking play. Although Oxton dominated possession and territory, they struggled to find a way into the Whitchurch dee and were unable to get any shots at goal. Richard Leigh and Paul Humphries were excellent in midfield, constantly breaking up Oxton’s play and diligently passing the ball out of dangerous areas using David Brunyard and Joe Faithfull to carry the ball into wider areas. Anything that got close to the dee was well dealt with by the defence of Doug Buckeridge, Brendan Coburn and Alex Leigh. As legs tired and the home side’s frustrations grew, Whitchurch began to find more space going forward. Fred Egerton and Ethan Gresty we’re linking well to provide a threat down the left, and Joe Faithfull and Richard Leigh combined to fire in some dangerous crosses that needed the home keeper to kick clear of the dee. But spaces also began to open up for Oxton’s numerical advantage, and towards the end of the half, the Wirral side won and scored from each of four short corners. Three of the goals were well struck from the edge of the dee, and one poked in at the back post after a series of ricochets off defending sticks and feet. Although slightly disappointed to be 4-0 down at halftime, Whitchurch could be quite proud of the fact that Oxton hadn’t created any threat to the Reds goal from open play. The challenge for the second half would be to continue the hard work and frustrate Oxton’s superior numbers. Again in the opening stages of the half, Whitchurch did well to keep Oxton at arm’s length. The home team were looking to overload the Whitchurch defence and did create some half chances in the dee, but when the ball did get close to the goal Owen Pearce did well to narrow angles or kick clear. However, midway through the half, Oxton were fortunate to extend their lead when the ball appeared to be controlled by a foot in the build-up to the goal. Whitchurch were undeterred. 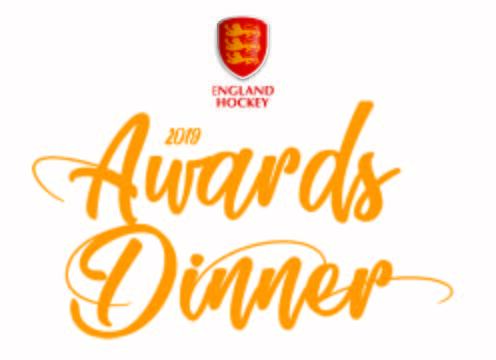 They continued to play their hockey and eventually got their reward as Alex Leigh and Ethan Gresty combined really well down the left, with Ethan crossing to an unmarked Joe Faithfull who swept the ball past the Oxton keeper into the goal. Oxton added a further two goals late in the game to make the final score 7-1 to the home side but, despite the size of the defeat, Whitchurch should be proud of their efforts. They played a very good side, with a formidable home record and despite being a player short managed to score a really good goal against a team not used to conceding at home. Richard Leigh & Paul Humphries had to put in a huge amount of work in midfield, Fred Egerton & David Brunyard provided the drive forward, with Joe Faithfull adding width on the right. Joe thoroughly deserved his goal for all of his hard work this season. In the last 2 matches, 4 different players have all scored their first goals in senior hockey for the 2s … a sign of the team’s progression this season. Brendan Coburn was, again, formidable in defence, but the standout performance came from Alex Leigh in only his second game in senior hockey. His defending was excellent, with his jab tackle constantly breaking up Oxton’s play down the Whitchurch left. But Alex’s calmness in possession and sensible passing enabled Whitchurch to retain the ball even when under pressure from their opponents. The Reds goal stemmed from his excellent interplay with Ethan Gresty. The 2s next match is a lunchtime fixture away to top-of-the-table Chester 6s. Whitchurch started the game well with excellent defending by Mel Reid and Sally Pearce. However, Bebington made a quick run down the middle of the pitch managing to get round all the defenders and put the ball in the goal. Mia Spruce and Emily Lister worked hard, battling to get Whitchurch back in control of the ball however another goal followed soon after the first. Wendy Cooper and Jan Teggin worked hard in the middle delivering some excellent tackles. Despite Whitchurch’s effort, two more goals were scored. With Wendy Cooper injured, Whitchurch needed to come together and work even harder in the second half. In the second half, several strong attacks were made by Leanne Read, Eliza Brown and Holly Gilbert which finally resulted in a well deserved goal scored by Read. Laura Workman and Kate Buckeridge worked hard on the left wing with multiple attacks made by Laura and good passes into the dee by Caitlin Edwards. Louise Cottrell made some brilliant saves in goal preventing several goals off Bebington’s well rehearsed shot corners. Unfortunately, Bebington scored again making the score 5-1 at the final whistle blew.